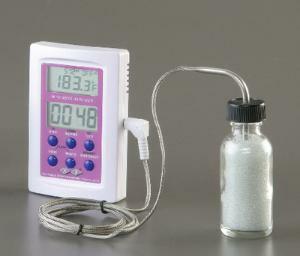 Ideal for taking readings in freezers, refrigerators, incubators, and ovens. 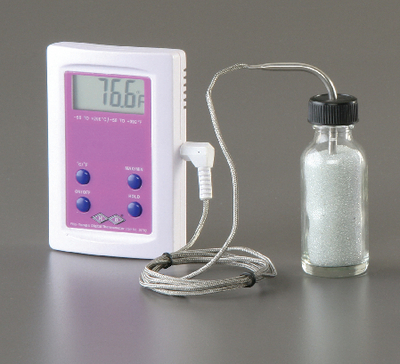 Non-toxic and non-hazardous, the unique Enviro-safe liquid used in these bottle and probe thermometers makes them safe for any work environment. The unbreakable bottle eliminates accidents in the lab and the Teflon coated probe contains any breakage or spills. Each individually serialized thermometer is supplied with a statement of accuracy indicating calibration tracable to NIST and DKD. Available with or without timer alarm. Model without alarm; temperature range: –50 to 200°C (–58 to 392°F), size of probe: 5". Model with alarm; temperature range: –50 to 300°C (–58 to 492°F).